Click on the PDF order form link below to print and mail with your check. TONAWANDA AND NORTH TONAWANDA: 1940-1960 celebrates the American Dream, and an era when teenagers were rock-n-rolling at school dances and hanging out at Zeffery’s, the Sugar Bowl, and Pee Wee’s Pizzeria. Books may be purchased at the Museum Gift Shop during regular business hours. The editorial team of Patrick Barnard, Alice Roth, John Slater, Ned Schimminger, and Terry Wegler began work early this year, first establishing a vision for the book, then moving on to photo selection, historic research and finally, developing captions for each of the almost 200 photos that would be included. The consensus was that a second book should be different from the first. 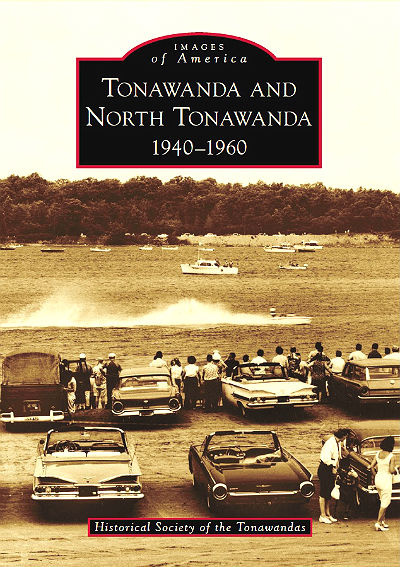 Rather than another which focused on the early history of the Twin Cities, a more limited time frame would bring back memories to the vast majority of society members who grew up in the Twin Cities during that period of time between 1940 and 1960, when Tonawanda and North Tonawanda virtually redefined themselves. The waning lumber industry gave way to manufacturing. That accommodated first the war effort, and then postwar market demands. After the war, men and women returned to family life, and the baby boom began. New homes, new schools, and new roads were built to serve the burgeoning population. Meanwhile, local industries expanded, and new businesses took root. Good-paying jobs were plentiful, as were consumer goods such as televisions, modern appliances, and new cars. Community pride was evident, with volunteers swelling the ranks of fire companies, churches, and service clubs. Downtown had dozens of shops, departments stores, restaurants, and entertainment venues such as the Riviera and Melody Fair. The Historical Society of the Tonawandas has again drawn on its vast archival resources to produce a pictorial history of our close-knit community as it dug out of the Depression, struggled through the war years, and cruised into the fabulous 1950s.